Reality is myth, math, metaphor, and magic - defined by the endless ways we figure out the true nature of the illusion in which we are experiencing. It's about the alchemy of consciousness in the illusion of time, for souls to experience on many levels simultaneously. There is one soul who guides this - Thoth the scribe who writes the programs of experience. Thoth went by many names and identities, including Hermes, Merlin, Isis, and other persona that identity him as a magician. Every ancient civilization had its wizards and magicians whose job it was to empower the people about reality as magic and illusion. They are also connected to Ancient Alien Theory as they were not from this physical reality. We move now to - the Hermetic Order of the Golden Dawn (or, more commonly, the Golden Dawn) - a magical order active in Great Britain during the late 19th and early 20th centuries, which practiced theurgy and spiritual development. It has been one of the largest single influences on 20th-century Western occultism. Concepts of magic and ritual at the center of contemporary traditions, such as Wicca and Thelema, were inspired by the Golden Dawn. Thelema is a spiritual philosophy (referred to by some as a religion that was developed by the early 20th century British writer and ceremonial magician, Aleister Crowley. He came to believe himself to be the prophet of a new age, the Aeon of Horus, based upon a spiritual experience that he and his wife, Rose Edith, had in Egypt in 1904. By his account, a possibly non-corporeal or "praeterhuman" being that called itself Aiwass contacted him and dictated a text known as The Book of the Law or Liber AL vel Legis, which outlined the principles of Thelema. The Thelemic pantheon includes a number of deities, focusing primarily on a trinity of deities adapted from ancient Egyptian religion, who are the three speakers of The Book of the Law: Nuit, Hadit and Ra-Hoor-Khuit. 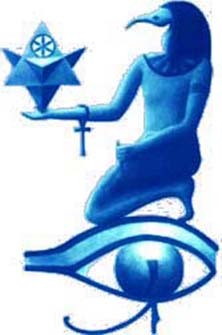 The religion is founded upon the idea that the 20th century marked the beginning of the Aeon of Horus, in which a new ethical code would be followed; "Do what thou wilt shall be the whole of the Law". This statement indicates that adherents, who are known as Thelemites, should seek out and follow their own true path in life, known as their True Will rather than their egoic desires. The philosophy also emphasizes the ritual practice of Magick. The word "Thelema" itself is the English transliteration of the Koine Greek noun "will", from the verb "to will, wish, purpose." In the New Testament as well as the works of Plato, Thelema includes the ideas of will, choice, inclination, desire, including sexual desire, and pleasure. As Crowley developed the religion he wrote widely on the topic, producing what are collectively termed the Holy Books of Thelema. He also included ideas from occultism, Yoga and both Eastern and Western mysticism, especially the Qabalah. The three founders of The Hermetic Order of the Golden Dawn - William Robert Woodman, William Wynn Westcott, and Samuel Liddell MacGregor Mathers - were Freemasons and members of Societas Rosicruciana in Anglia (S.R.I.A.). Westcott appears to have been the initial driving force behind the establishment of the Golden Dawn. Influences on Golden Dawn concepts and work include: Christian mysticism, Qabbalah, Hermeticism, the religion of Ancient Egypt, Theurgy, Freemasonry, Alchemy, Theosophy, Eliphas Levi, Papus, Enochian Magic, and Renaissance grimoires (textbooks of magic). The Golden Dawn as system and book has been the most intensively used source for modern western occult and magical writing. As a book it is both a text and an encyclopedia. The Golden Dawn system was based on hierarchy and initiation like the Masonic Lodges; however women were admitted on an equal basis with men. The "Golden Dawn" was the first of three Orders, although all three are often collectively referred to as the "Golden Dawn". 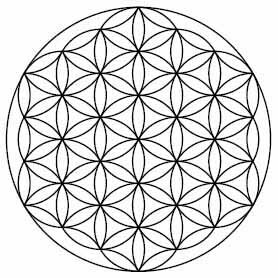 The First Order taught esoteric philosophy based on the Hermetic Qabbalah and personal development through study and awareness of the four Classical Elements as well as the basics of astrology, tarot divination, and geomancy. Hermetic Qabbalah - Hermetic Qabalah (From the Hebrew "reception", usually transliterated with a 'Q' rather than a 'K' or a 'C', to distinguish it from Jewish Kabbalah and Christian Cabbalah respectively) is a Western esoteric and mystical tradition. It is the underlying philosophy and framework for magical societies such as the Golden Dawn, Thelemic orders, mystical societies such as the Builders of the Adytum and the Fellowship of the Rosy Cross, and is a precursor to the Neopagan, Wiccan and New Age movements The Hermetic Qabalah is the basis for Qliphothic Qabala as studied by left hand path orders, such as the Typhonian Order. 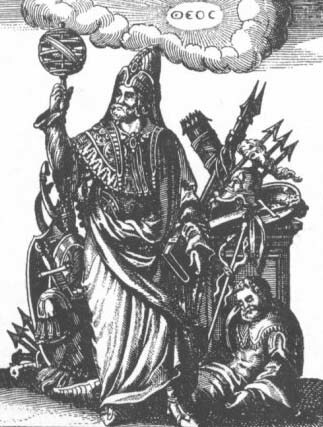 Hermetic Qabalah draws on a great many influences, most notably: Jewish Kabbalah, Western astrology, Alchemy, pagan religions, especially Egyptian and Greco-Roman (the latter being from which the term "Hermetic" is derived), neoplatonism, gnosticism, the Enochian system of angelic magic of John Dee and Edward Kelley, hermeticism, rosicrucianism, Freemasonry, tantra and the symbolism of the tarot. Hermetic Qabalah differs from the Jewish form in being a more admittedly syncretic system, however it shares many concepts with Jewish Kabbalah. 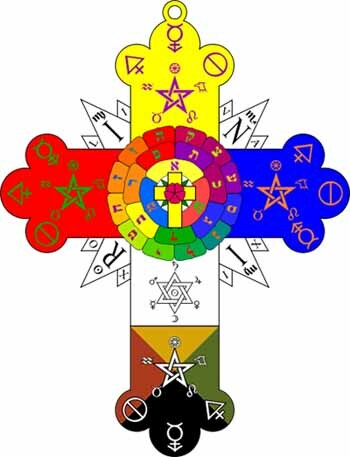 The Second or "Inner" Order, the Rosae Rubeae et Aureae Crucis (the Ruby Rose and Cross of Gold), taught proper magic, including scrying, astral travel, and alchemy. The Third Order was that of the "Secret Chiefs", who were said to be highly skilled; they supposedly directed the activities of the lower two orders by spirit communication with the Chiefs of the Second Order. The foundational documents of the original Order of the Golden Dawn are known as the Cipher Manuscripts -- written in English using Trithemius cipher. The Cipher Manuscripts are a collection of 60 folios containing the structural outline of a series of magical initiation rituals corresponding to the spiritual elements of Earth, Air, Water and Fire. The "occult" materials in the Manuscripts are a compendium of the classical magical theory and symbolism known in the Western world up until the middle of the 19th century, combined to create an encompassing model of the Western Mystery Tradition, and arranged into a syllabus of a graded course of instruction in magical symbolism. It was used as the structure for the Hermetic Order of the Golden Dawn. The Manuscripts give the specific outlines of the Grade Rituals of the Order and prescribe a curriculum of graduated teachings that encompass the Hermetic Qabalah, astrology, occult tarot, geomancy, and alchemy. According to the records of the Order, the manuscripts were passed from Kenneth R. H. Mackenzie, a Masonic scholar, to Rev. A.F.A. Woodford, whom British occult writer Francis King describes as the fourth founder (although Woodford died shortly after the Order was founded). The documents did not excite Woodford and in February 1886 he passed them on to Freemason William Wynn Westcott, who managed to decode them in 1887. Westcott was pleased with his discovery and called on fellow Freemason Samuel Liddell MacGregor Mathers for a second opinion. Westcott asked for Mathers' help to turn the manuscripts into a coherent system for lodge work. Mathers in turn asked fellow Freemason William Robert Woodman to assist the two and he accepted. Mathers and Westcott have been credited for developing the ritual outlines in the Cipher Manuscripts into a workable format. Mathers, however, is generally credited with the design of the curriculum and rituals of the Second Order, which he called the Rosae Rubae et Aureae Crucis ("Ruby Rose and Golden Cross" or the RR et AC).